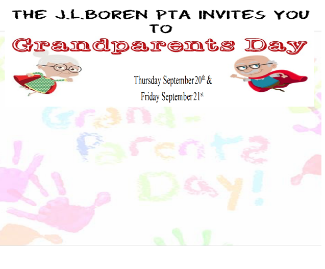 Share the love of learning with your child’s grandparents by inviting them to Boren’s annual Grandparents Day. They can visit classrooms, enjoy lunch in the cafeteria and visit the Scholastic Book Fair. The PTA Family Appreciation Committee will also be offering refreshments in Room 23 as well as a fun photo opportunity.